MELVILLE, N.Y. – Canon U.S.A., Inc., a leader in digital imaging solutions, today announced the expansion of the imagePROGRAF PRO Series with four large format inkjet printers. The extension of the Series includes the 11-Color plus Chroma Optimizer 44-inch imagePROGRAF PRO-4000 and 24-inch imagePROGRAF PRO-2000, designed to provide spectacular image quality for the fine art and photographic markets, as well as the eight-color 60-inch imagePROGRAF PRO-6000S and 44-inch imagePROGRAF PRO-4000S, two affordably priced models to economically create eye-catching posters and vivid displays for the production signage industry. Continuing to deliver output solutions for photographers who are “equally obsessed” with the printed image, the imagePROGRAF PRO-4000 andare 11-color plus Chroma Optimizer printers delivering the quality demanded by the fine art community. Complementing Canon’s professional line of DSLR cameras not only in their appearance, but also in their ability to create industry-leading imagery, these new models ensure a level of stunning Canon image quality from input to output, known as “Crystal-fidelity.” Mirroring the imagePROGRAF PRO-1000, the 11-color models are also marked by the distinctive Canon red line, echoing the same red line found on Canon’s EF L-Series lenses. The LUCIA PRO 11-color plus Chroma Optimizer ink system provides exceptional image quality, allowing for increased color gamut, reduced bronzing, improved scratch resistance, greater image clarity, gloss uniformity and excellent shadow reproduction, as well as increased black optical density. Compared to previous models, the Series features a wider print head (1.28-inch wide) with anti-clogging technology, which improves efficiency as well as reduces cleaning cycles and prevents wasted ink. This newly developed print head allows for a more compact printer design as only one print head is installed in each PRO Series printer. Additionally, all models maintain high print quality with a multi-sensor that calibrates the printer, ensuring color consistency from the first print to the last. They also feature a redesigned high-precision mechanical platform, providing a uniform, rigid frame to reduce vibrations during printing and more accurate ink ejection. The models also feature effortless media feeding capabilities, allowing photographers to no longer have to worry about blemished prints due to fingerprints. For increased versatility, a Multifunction Roll System comes standard in the 60-inch eight-color model and is an option for the 44-inch and 24-inch models in the Series, marking its first appearance in a 24-inch imagePROGRAF printer. When used as a dual roll, the Multifunction Roll System will enable users to load glossy media in one roll and matte media in the other to seamlessly print to both rolls without needing to switch media or black inks. The Multifunction Roll unit will intelligently send the job to the correct media, automating the process and providing increased ease of use. The roll can also act as a take-up unit with bi-directional rewind, ideal for long, uninterrupted print runs. All four new models feature the L-COA PRO processing engine for high-precision image reproduction and high-speed processing of high resolution data. The Sub-Ink Tank feature loved by users of the imagePROGRAF Series has been carried over to these new models, helping to reduce downtime and minimize costs by automatically enabling ink tank replacement during printing. The eight-color models utilize the same new 12-channel print head but the key colors of C, M, Y and MBk are arranged symmetrically in a mirrored arrangement, helping to realize high-speed printing, as well as high-color density. Further enhancing the user experience with these new imagePROGRAF PRO printers is the intuitive software solution of Print Studio Pro. With a focus on quality and ease of use, Print Studio Pro is a plugin for Adobe® Photoshop®, Adobe Lightroom®2 and Canon Digital Photo Professional software, to easily exports files directly to the printer.1 The Quick Utility Toolbox feature provides users with a portal to launch and control software from one central interface, and Accounting Manager is included to help photographers keep track of consumable costs such as ink and media, helping users to determine their overall printing expenses. Also included is Device Management Console, an administrative tool which provides users with the means to manage up to 50 imagePROGRAF PRO Series printers by monitoring activity such as error messages and printer information such as the execution status of calibrations, all from one location. These imagePROGRAF PRO models are expected to be available in late spring of 2016. The imagePROGRAF PRO-4000 is available for an MSRP of $5,995 or $6,995 with the addition of the optional Multifunction Roll System. The imagePROGRAF PRO-2000 is available for an MSRP of $2,995, or $3,795 with the optional Multifunction Roll System. The imagePROGRAF PRO-6000S comes standard with the Multifunction Roll System at a Manufacturer’s Suggested Retail Price (MSRP) of $9,995. 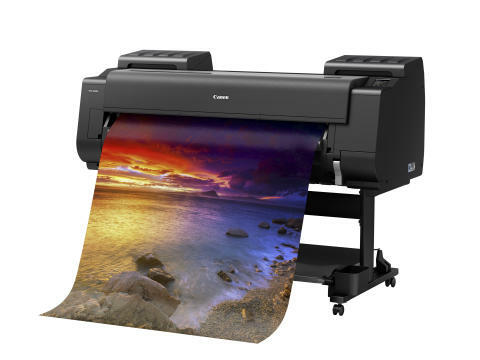 The imagePROGRAF PRO-4000S is available for an MSRP of $4,995, or $5,995 with the optional Multifunction Roll System. The previously announced PRO-1000 is available for an MSRP of $1,299.99. To keep apprised of the latest news from Canon U.S.A., sign up for the Company’s RSS news feed by visiting www.usa.canon.com/rss and follow us on Twitter@CanonUSA. For media inquiries, please contact pr@cusa.canon.com. Availability, prices and specifications are subject to change without notice. Prices are set my dealers and may vary. 1 Wireless printing requires a working network with wireless 802.11b/g or 802.11n capability. Wireless performance may vary based on terrain and distance between the printer and wireless network clients. 2 Adobe® Photoshop® and Adobe Lightroom® software must be purchased separately. Next post: Epson Rebates & Savings!